Deepwater Frontage well kept rental home with gas fireplace on Bailey Island, Maine. Well kept home with first floor bedroom. View from deck. View of the house from the quiet street it is located on. Water side of house View from water Spectacular Sunset additional views deck and views looking towards Portland Steps down to the rocky shorefront entryway when you enter house View of the kitchen area. Alternate view of the kitchen area. View of dining area. View of the living room from the dining area. Views from bay window. Downstairs bedroom with queen bed. Downstairs bathroom. Upstairs bedroom with two twin beds. Upstairs bedroom with king bed. Upstairs bathroom with shower/tub Another view of upstairs bathroom with two sinks. Another view of upstairs bathroom with two sinks. 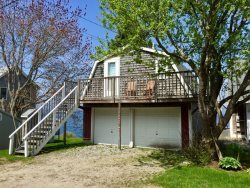 This 3 bedroom, 2 bathroom, year round home has a large deck and steps to the rocky shore! From the deck watch the lobster boats get their daily catch and enjoy spectacular sunset views over Harpswell Sound. There are steps that lead down to the rocky shore. This home is well maintained and equipped. Walk in to the well appointed kitchen to prepare a meal and enjoy it in the dining area surrounded by sliding glass doors with views of Harpswell Sound. Cozy up in the living room by the gas fireplace and enjoy the water views. There is a bedroom off of the living room and a full bathroom with a stand up shower. Upstairs there are two bedrooms and a full bathroom. The master bedroom has a king bed with spectacular views out to the water. The additional bedroom has two twin beds and views of the water. This home is tucked away on a quiet road yet centrally located on Bailey Island for great walking options. The deck has wonderful outdoor furniture, perfect for a cocktail at sunset or a book while basking in the sun and taking in the sea salt air. Parking is limited. There is a space in front of the garage and an additional space in front of the house. The studio apartment may be available for an additional $750. The view! The porch. Excellent television for watching baseball games too. We have twenty paintings to look at to remind us of our lovely stay. The neighborhood is really nice too. We met all the other neighbors and loved them. The staff has always been very courteous and helpful. Nice views...... western exposure of the rental property; proximity to restaurants, shopping and other points of interest.